It’s simple yet brilliant. While babysitting his granddaughters, they asked David to make friendship bracelets with them. This is a trend that’s had a recent surge in popularity as moms teach their kids this age old tradition with a bit of nostalgia. Friendship Bracelets are seen all over TV, and Tweens everywhere are making them. The process of making them involves securing a knot (online instructions will tell you to pin to your pants or hold with a nail in the wall!) and keeping the strings in order while knotting the threads. After one experience with the grandkids, David decided their must be a better way! Crorey Creations was able to tap into some of the best talent in Detroit (engineers, graphic designers, website developers) who have unfortunately found themselves unemployed in this tough economy. After many engineered drawings, prototypes and focus groups we now have a perfected, patented product. 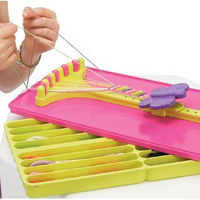 My Friendship Bracelet Maker is the right product (Quality Toy in the coveted craft sector), at the right time (current trend..focused on the right target demo = TWEENS) at the right price (under $25) and has already been named Dr. Toy’s “Best Vacation Products” Winner for 2010. This product will have appeal beyond the US market and can be global in scope, as evident through online research of friendship bracelets. Do you remember making friendship bracelets when you were a kid? Do you remember having to tie off the string with tape and then figuring out how to pull everything together in the end. This product was so much fun and it allowed my daughter to see some of the things that my wife did when she was a kid (I did not make friendship bracelets when I was a kid). In trying out this product my six year old was given the task to try this out for herself and see what she could come up with. Seeing that the product was made for kids starting at age six we thought this would be a great summer activity that she would enjoy into the future, and we were right. Now the only problem that we have is that her 3.5 year old sister wants to do it as well and it is still a bit beyond her level of comprehension. I found the instructions in this to be very self-explanatory and the variety of colors available to be adequate. One of the things that was great about this was that if you go to the website - myfbm.com they provide you with a ton of great ideas on how to make really cool patterns in your bracelets (ones I would have never even considered). Anyway, if you are looking for a fun summertime activity for the whole family, look no further than this!